Every time I eat corn I think back to my childhood when my Dad would bring home a couple of potato sacks full of just picked corn on the cob and we would invite all of our the neighbors over for a corn roast. We’d sit at picnic tables in the backyard, and my Dad would perfectly cook the corn on our outdoor grill. 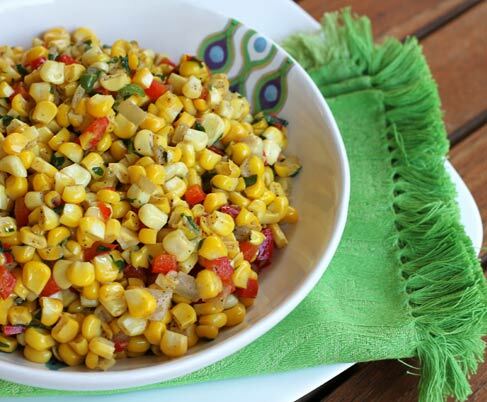 There was always corn leftover after these feasts that my Mom would cut off the cobs and serve us the next day as a side dish similar to this recipe. Fresh, sweet corn really doesn’t need anything added to it, but for a change of pace I sauteed some finely diced onion and sweet red pepper in a little olive oil, and then sauteed the corn with this mixture until it was perfectly cooked. This side dish is as pretty as it is flavorful and would make a great side dish for grilled meat. Heart healthy olive oil is used in place of butter. Corn has had a bad review by many in recent years, but it is considered a unique phytonutrient-rich food that provides us antioxidant benefits, and is a good source of vitamin C as well as the mineral manganese. This pretty vegetable side dish would be a great alongside grilled meats or seafood. Use a sharp knife to cut the kernels off the ears of corn. In a large frying pan, heat the olive oil and cook the onion and pepper for 4 to 5 minutes until soft. 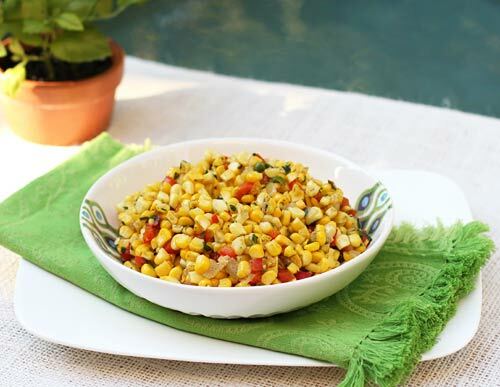 Add the corn, and stirring often, continue to cook for about 6 to 7 minutes or until the corn is tender crisp.